After dropping some heavy bucks to purchase a quality laptop, you will want to protect it from damages and scratches. It is not all the time that you will want to carry bulky laptop bags to store the device that is why you need a laptop sleeve. With this guide, you’ll get to know exactly what to look for in your new piece and the best laptop sleeves that the market has to offer. The Lacdo 15-inch laptop sleeve case is a slim looking laptop cover that’s been crafted from canvas fabric. The fabric is waterproof meaning contact with water and other liquids will not cause damage to your laptop. This waterproof laptop sleeve uses zippers that are tough to break and can last a lifetime to secure your belongings. The inner features an anti-static soft lining that will cushion your precious gadget in case it falls. The company also ensured it is convenient for keeping your extra accessories in and fitted two extra pockets. With its slim portable design, you get to choose whether to carry it or put it inside a bag. This could be the last time you buy a laptop case if you settle for this one. There are extra colors to choose from. It can fit any laptop between 14” – 15.4”. This will be the perfect choice for those days when you need to take your laptop, a notebook, and a pen with you in a small package. 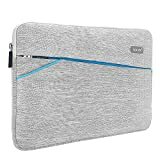 The durable fabric has been used for a snugly fit on the computer with a slim design that easily slips into a backpack or suitcase. The inner boasts a smooth anti-scratch suede lining covering the entire 12.6”×9.2” (L×H) that can comfortably hold 13” and 11” laptops. The laptop sleeve relies on a secure synthetic-leather Velcro closure that allows easy opening and closing. The company is thoughtful with two pockets at the back so you get extra storage for other small items you may carry. You will find a fold-over flap that ensures your laptop is fully secure. If you’re always carrying your laptop on trips, and are in need of a stylish cover for your device then this laptop sleeve bag is for you. 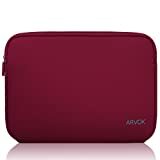 We are impressed that this particular cover can comfortably seat a laptop 15.6-inch screen though the manufacturer is fair enough to offer a variety of sizes to suit everyone’s demands. Even with its massive capacity, this laptop sleeve will still glide easily into your bag with a top-loading zipper which allows quick access to the laptop. 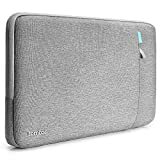 Additionally, polyester foam padding ensures the pressure that would occur if the laptop is dropped or pressed is evenly dispersed. Also, there is no worry for any damages of water-spill since it is waterproof. There is a wide variety of striking colors you can opt for. The package includes a small pouch bag that provides additional room for your mouse, phone, or charger. Buyers enjoy a one year warranty. What a decent and stylish way to protect your laptop from scratches, shock, and dirt? Anyone whose laptop is between 13” – 14” is assured of zero damages in the event that the laptop drops to the ground or presses against an oblong object inside their bag. This is made possible by the thick neoprene material. 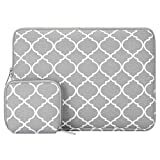 The manufacturer of these laptop sleeves also provides additional sizes to suit different needs. It is worth noting that this material is waterproof so there will be no entry of spillages that may damage your valued machine. We are almost sure that you’d prefer the easy-to-use top loading zipper closure allow you to access you’re the gadget in a snap. This is the perfect waterproof laptop sleeves. There are many vibrant colors you can go for. The company covers this laptop sleeve with a 24-month warranty and offers lifetime customer support. 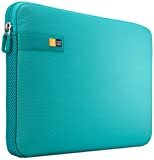 This is another strong yet tender sleeve case for devices up to 16” long and 10” wide. Apart from the fact that this piece truly shines for its striking looks, you’d appreciate that it’s resistant to tear, cushiony to prevent any impact yet still fine enough on the inner to keep it away from scratches. A top-loading zipper ensures that putting in and taking out your laptop is a lot easier. If you intend to carry it in the briefcase, it easily inserts courtesy of its streamline design. Also visible is a seamless construction and woven webbing on all the sides that add to the varied options of colors that fit any personality to give an elegant and irresistibly appealing finish. You get to choose from a wide variety of attractive colors. The wrap finish provides a snuggling fit. 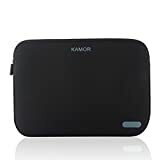 There is no magical laptop sleeve that completely provides entry of liquids in case there’s a spill but Kamor case does a pretty good job of resisting water molecules. It is created from water-resistant neoprene material and will fit any device below 16.7 inches. It is slim too meaning you can simply toss it into your bag. A further nod to the company is the way this sleeve conforms to the shape of your computer. This should worry you as there is additional room for your adapter, pen or writing pad. 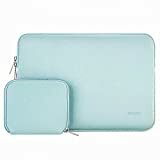 The zipper has a plastic cover that ensures you enjoy long-term benefits while still making it easy to use so accessing your laptop should be a breeze. The company offers many color options to match your preference. You will get to choose the size that fits your device from the available sizes. Tomtoc laptop drop-proof sleeve is praised for all-round protection and a design that is all for an efficient tool. It boasts a patented CornerArmor feature and protective ridges design on the inner surfaces that will guard your device against the breaking on dropping or a bumpy ride. The best part, The bag features USB charging ports for convenient phone charging while on the go. The slim design means it can fit into the tightest of spaces. There is an extra pocket for any other relevant items you may want to take into the board meeting. The sleeve has a top loading zipper that makes it been easy to put on and remove the gadget when in need. There are different sizes to choose from. The color options are amazing. Take away any worry while walking, riding or you, unfortunately, happen to drop your delicate laptop with this laptop sleeve bag. This sleeve bag cover uses a polyester foam padding layer to provide excellent cushioning while still slim and lightweight enough to simply squeeze into another bag. An intuitive top loading zipper system means that accessing your laptop is easy and swift. To cater to all demands, the company provides for a multiple of sizes and a wide variety of beautiful colors for buyers. It is the kind we recommend you to get without any fear of contradiction. The company is generous with an extra storage pouch for storing accessories. There is a one year warranty on every bag. This piece stays true to the quality and functionality offered by the other previous models but also improves upon them. You can’t fail to notice handles for comfortable and secure carry. The manufacturers assure that the materials used are eco-friendly yet tough. This means the one of a kind laptop sleeve will save you the agony of learning from your own mistakes and give you the service you need for years thanks to well-made construction. The protective case will not allow any water molecules to reach your treasured gadget. The zipper also makes it easy to store the laptop in it and also facilitates easy removal. Like other reputable brands, this one gives you the freedom to choose your preferred size and color. The ProCase is no disputable be one of the best laptop sleeves in 2019. You will find a front-pocket for other small items. With the 180-degree full-open, passing through the checkpoint when traveling by airplane should be easy for you. Scooping the top position in our list is this incomparable laptop sleeve. This capable tool will hold your computer tightly and features neoprene padding, so we expect less concern when you accidentally drop a laptop inside the sleeve. The carriage is fastened by a top-loading zipper that does not pose any difficulty while opening and closing and can withstand everyday use. The manufacturer clearly respected the scarcity of your carriage space and made this case quite slim to perfectly fit in small spaces. 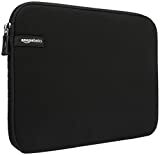 These AmazonBasics laptop sleeves are the best laptop sleeves for 15.6″. You are free to choose from the available sizes and colors. You get a 1-year warranty. This is undoubtedly the most important factor. Before settling on a specific type of laptop sleeve, ensure it can comfortably hold the laptop it is intended for. The size of the screen is measured diagonally across the screen. The most common materials used are neoprene, polyester, canvas, and leather. Leather cases are more durable yet expensive. Canvas is durable and ecologically friendly but lacks waterproofing capabilities. Neoprene and nylon sleeves, on the other hand, make waterproof sleeves, shockproof and cheap but lack extra pockets for storage. Depending on which one you prefer, carefully select a material that is functional and durable. Padded and foamy sleeves offer more protection in case a laptop drops. If you simply need a nice carriage for the computer before slipping it into their backpack, you may opt for a simple sleeve with less cushioning. You may also prefer a color that completes your look. If you use your laptop between home and work, it is essential to protect your laptop not just against damages from dropping but scratches caused by other items inside the bag. Compared to larger bags, sleeves are easier to clean and maintain. Considering how sensitive and delicate laptops are, carrying them around should be with utmost caution. Click to purchase preferred laptop sleeve and start giving your computer some well-deserved proper shelter. It is high time you break from your trial and error method. This article walks you through the top 10 brands for quick purchase. Be sure to add one of them to your cart!